Dr. Spencer is an assistant professor in the UW Gynecologic Oncology program and the associate director of the Gynecologic Oncology fellowship-training program. He has won a number of teaching awards from both medical students and for the surgical teaching of resident physicians. 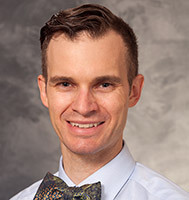 Dr. Spencer has given talks in the Wisconsin region and nationally regarding the use of minimally invasive sentinel lymph node biopsies for gynecologic cancers, optimizing care for patients with gynecologic cancer syndromes and incorporating techniques to improve the quality of life of cancer patients. In addition, Dr. Spencer earned an MS in Clinical Investigation. Dr. Spencer has received numerous funding awards for his research that looks at developing interventions to improve cancer patients’ quality of life during treatment and in the survivorship period. Additionally, he has multiple national research presentations looking at decreasing health disparities in gynecologic cancer care and ways to improve the funding gap for gynecologic cancer clinical trials. Dr. Spencer believes that the best care is delivered when patients and their doctors work together - using the best available information with cutting-edge advancements to deliver a high quality, individualized treatment plan that maximizes both the chance for cure and a patient’s quality of life. Dr. Spencer is a big proponent of clinical trials to keep patients at the forefront of the latest innovations in gynecologic cancer care.